Director of the Sala Baï School in Cambodia. In 2016, in Southeast Asia, the IECD decided to create a regional network of hospitality-catering training enterprises: the ASSET-H&C network (Association of hospitality-catering social training enterprises in Southeast Asia). It aims to improve the training offering and currently has 14 member schools, in five countries. Thus, every year, about 2,200 young people and adults in difficult economic, social and/or educational situations benefit from high quality training that helps them towards social and professional integration. 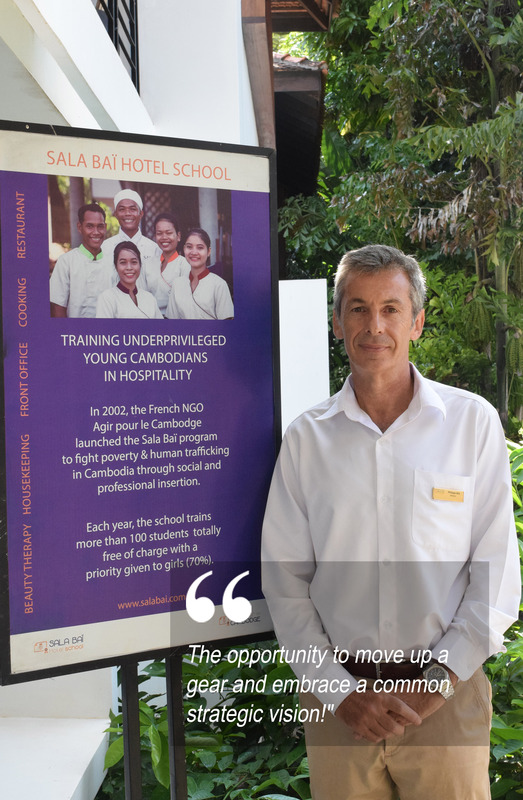 Philippe Bès is the Project Director of the SALA BAİ hospitality-catering school in Cambodia. He took part in the first ASSET-H&C annual seminar and offers us his impressions. « It is always beneficial to take a step back from everyday school life and exchange ideas with peers working in the same sector. This seminar offered the opportunity to go even further and embrace a common strategic vision. After these two days, I have a better understanding of our main challenges, such as the integration of the recommendations of the Association of Southeast Asian Nations (ASEAN) into our training syllabuses. Sharing good practices is a particularly enriching and fruitful exercise, in particular via the workshops designed, for example, to increase the amount of self-funding for our projects.